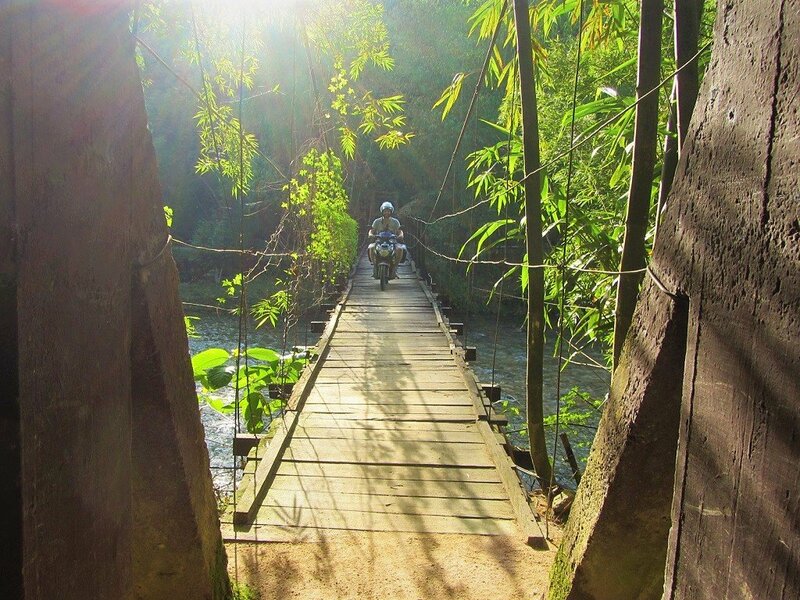 Located on a small, paved lane, about 20km west of road DT177, Panhou Village Ecolodge is accessed via a narrow, wooden bridge, suspended above a rocky river. Even when you’re on road DT177, you’re already off the beaten path, so by the time you reach the Ecolodge, you’re way off the grid. Panhou is a few kilimetres north of Thong Nguyen hamlet, which isn’t much more than a cluster of concrete houses at a rural crossroads. The nearest town of any size is Hoang Su Phi, 25km to the north. And Ha Giang, the provincial capital, is a 3-hour drive northeast of the Ecolodge. What’s more, many of the local roads are regularly blocked due to landslides, such is the mountainous nature of the surrounding terrain. In short, Panhou Village Ecolodge is remote. With this isolation comes spellbinding landscape. 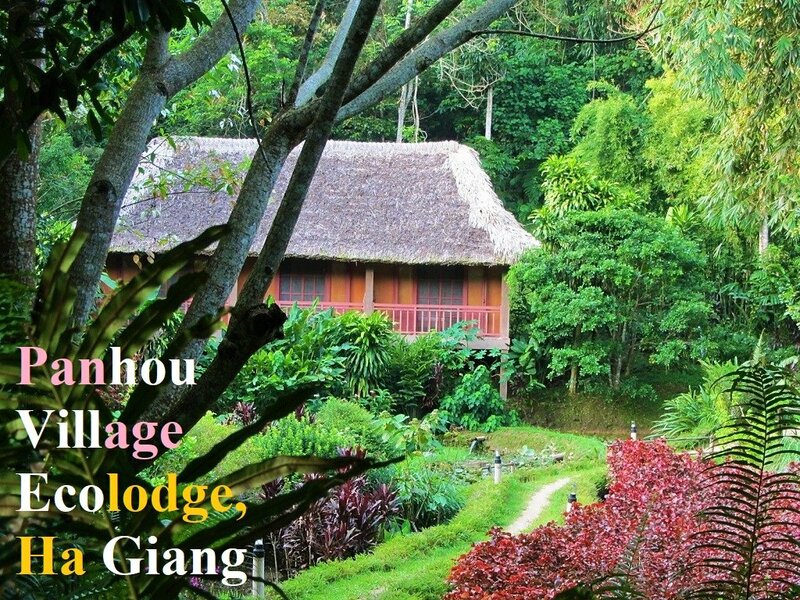 For most Vietnamese, the name Hoang Su Phi, the district in which Panhou is located, conjures romantic images of a wild, mist-shrouded mountainscape, where forests are punctured by waterfalls, and rice terraces grace the valleys. And this romanticized image is, well, pretty much accurate. It’s a majestic part of Vietnam; a region with genuine grandeur. And yet, there’s still very little tourist infrastructure here, which is one of the reasons Panhou Ecolodge is so special and unique. It was established specifically for travellers who wanted to experience this part of Vietnam, especially on trekking holidays. Personally, I think of Panhou as a place to treat myself in the middle of a long motorbike road trip, specifically the Borders & Back-Roads route, between Sapa and Ha Giang. Unsurprisingly, given its remote location, getting to Panhou Ecolodge requires a long journey. You can get here independently by motorbike (or a very challenging bicycle ride) or hired private vehicle. The nearest transport hub is Ha Giang city, but from there, local buses will generally only get you as close as the town of Hoang Su Phi. 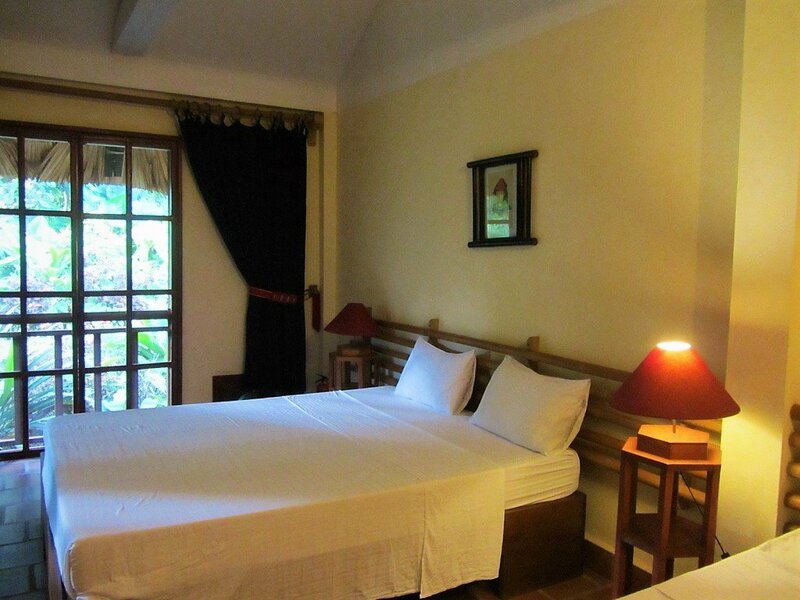 Or, if you book in advance, the Ecolodge can arrange transportation for you from Hanoi or Sapa, at an extra cost. Either way, it’s a day’s journey, perhaps more if road and weather conditions are bad. 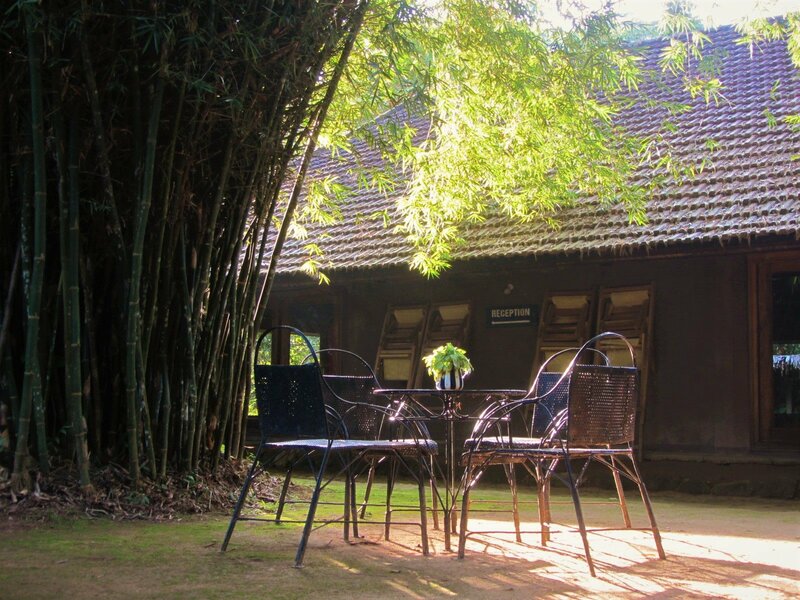 The Ecolodge is nestled on a patch of flat land between the riverside and the hills behind. It’s a small complex that resembles a traditional hamlet. 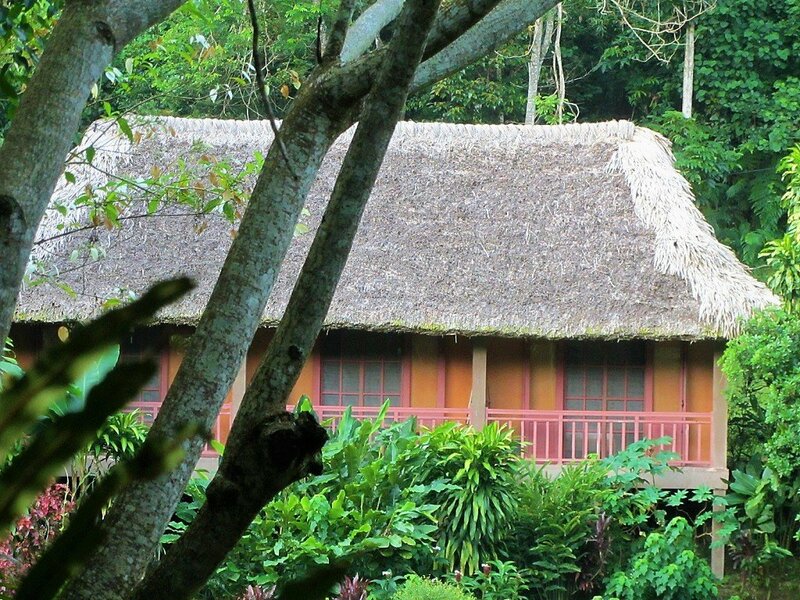 The grounds are extremely lush: tropical plants, trees, and flowers grow profusely all around the property – you can almost see the foliage growing as you walk through the gardens. In amongst this jungle are dotted several thatched structures, connected by meandering stone pathways. The gardens and buildings are very well kept and cared for by a staff that includes local people from ethnic minority groups. Twenty three guest rooms, including doubles and triples, are tastefully but minimally furnished. Wooden desks, bamboo chairs and curtain rails, bedside lamps, crisp white sheets, and tiled en-suite shower and toilet are enough to make the rooms comfortable and cosy. There’s a ceiling fan, but no air-conditioning. Windows open onto the lovely gardens and feature mosquito netting so that you can leave them open at night for the breeze without letting the bugs in – a simple feature, but one that most accommodations in Vietnam lack. 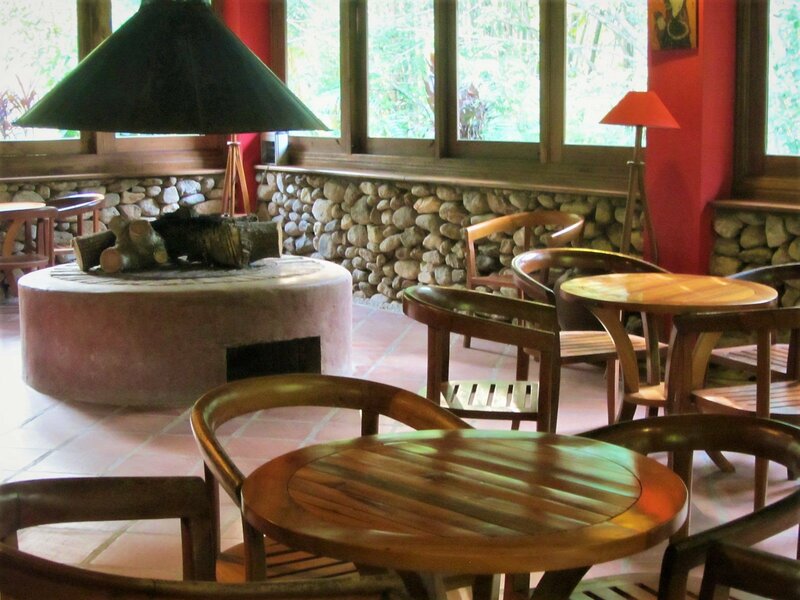 As the name suggests, Panhou Ecolodge is ostensibly an environmentally friendly property. Solar panels heat the water, local materials are used for building, local people are employed, and local ingredients – many of which are grown on the property – are used in the cooking. I always find it difficult to judge, but on the surface at least this eco-lodge does appear to be low-impact and sustainable. Breakfast, including excellent bread and home-made jams, is included in the room price. 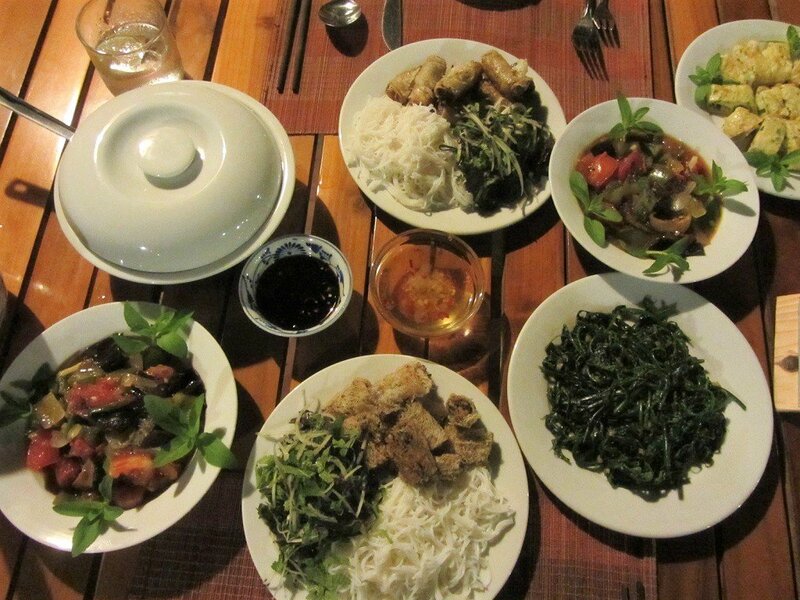 Lunch and dinner are set menus consisting of good Vietnamese highland dishes. There are vegetarian options, too. All meals are a flat rate of $13 per person. If you have your own transport, you can go a few kilometres down the road to Thong Nguyen hamlet for a meal at a quán cơm (rice eatery), but otherwise the only option is to eat at the Ecolodge. The restaurant and bar are (somewhat unnecessarily) housed in separate structures close to one another, both of which appear to blend traditional architectural motifs with modern flourishes. The bar offers a good list of cocktails, which must be the only ones for miles around. A gin and tonic or Campari and orange next to the blazing, open fire after a long day’s trekking or motorbiking in the mountains is a real treat. Another treat after an excursion is to indulge in one of the traditional, herbal, therapeutic baths on offer.